A CITY is defined as a municipal center that has been formally incorporated as a city by virtue of having been granted a city charter by the State of New York. The New York definition of a city, then, is much the same as that in any other state of the US. Today, New York state has 62 cities. Two of them, New York City and Albany, received their charters from the Crown during colonial times, and after independence, the first New York State Constitution recognized those charters. Between 1777 and 1834, the State of New York granted charters to seven more cities, including Troy in 1816. The only two cities that Rensselaer County has ever had are still cities today. They are Troy and Rensselaer. Details are in our Cities table. A TOWN in New York state is defined as a subdivision of a county. The word "town", then, is applied in New York state to what in many other states would be called a "township". Whereas in many other places in the USA a town is simply the same thing as a city only smaller or the same thing as a village only larger, in New York state, "town" is not used in that sense. Every single location in New York state, no matter how rural, lies within a county AND within a town or city. "Town" status is formally conferred by the State of New York. 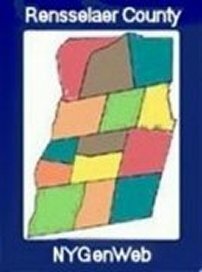 Rensselaer County today has 14 towns, all listed in our Towns table. Schodack and Stephentown are examples of towns in Rensselaer County today. Rensselaer County once had two other towns that have ceased to exist as towns: (1) the Town of Greenbush, which became the City of Rensselaer in 1897, and (2) the Town of Lansingburgh, which was absorbed partly into the City of Troy and partly into the Town of Schaghticoke in 1900. A VILLAGE in New York state is defined as a legally incorporated general-purpose municipality with 500 or more inhabitants that has been granted "village" status by the State of New York and which has not relinquished that status through established procedures. A village is traditionally larger than a hamlet but smaller than a city, but of the 556 villages in New York state today, 182 have larger populations than the smallest of the state's 62 cities - and one of those 182 is the Village of Hoosick Falls, population 3,600, compared to the City of Sherrill, in Oneida Co, NY, which claims a population of 3,200. "Village" status is formally conferred on a locality by the State of New York. Villages have their own local governments. The New York state definition of a village, then, is much the same as that in any other state of the US. Villages vary in size and population. Castleton-on-Hudson and Valley Falls are examples of villages in Rensselaer County. According to an article published in the 12 August 2003 edition of the Times-Union newspaper of Albany, NY, a pressure group has put forth a proposal for the hamlet of Defreestville in the town of North Greenbush to seek village status to "set up defensive lines against urban sprawl"; if Defreestville should become a village, we'll add it to our Villages table. A HAMLET in New York state is defined as any unincorporated settlement. Traditionally, a hamlet is smaller than a village, but even a community of some size that remains unincorporated is still a hamlet. The New York state definition of a hamlet, then, is much the same as that in any other state of the US. A hamlet does not have a local government. When a village by referendum and following procedures set out by the State of New York decides to relinquish its village status, it reverts to the status of hamlet. Many communities that are defined in sources such as French's Gazetteer in the 19th century as "villages" are today hamlets. Because hamlets are not incorporated, there is no easily accessible comprehensive list of hamlets. We are attempting to compile a comprehensive list of the hamlets in Rensselaer County, and we welcome any input from you! Our Hamlets table, found on our Place Names page, is a work in progress. Sand Lake, East Schodack and Walloomsac are examples of hamlets in Rensselaer County today.